What is a holiday without some dancing? Visitors and local holidaymakers are also invited to a New Year’s dance on December 31st at the same venue with performers Sam and Calla. Tickets are R100 each and bookings can be made with Johan (083 309 3894). 3 Ankers (just off the Jongensfontein road in Bosbokduin Avenue) caters for the younger generation (no under 18s from 11 Dec. to Jan 2nd) and are open every everning except for December 24th and 25th with the regular ‘Touchies’ after-party on 26 December. Keep an eye on their Facebook page for more detailed information. In Jongensfontein, regular ‘sokkies’ – such a great word in Afrikaans and everyone understands it! 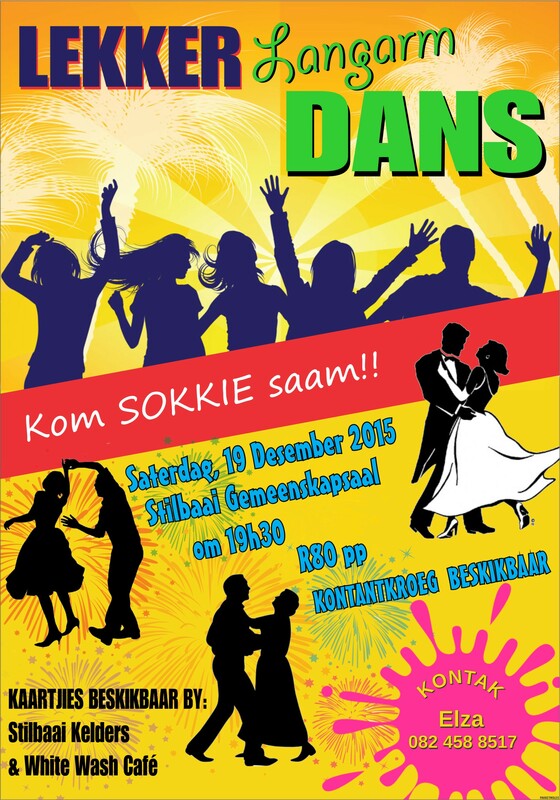 – hosted by the Stranddienste for the youngsters, will again be held at the cement pad at the caravan park. Dates will be confirmed on the daily program.